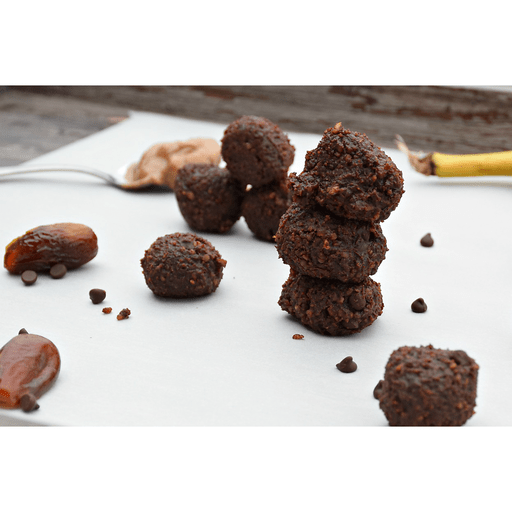 Thanks to delicious dates, these bites are sweetened with natural sugar, making this a tasty treat that can be enjoyed guilt free! 1. Add walnuts, dates, vanilla extract and cocoa powder to a food processor. Pulse until all ingredients are mixed and ground into small pieces. 1. Transfer fruit and nut mixture from food processor to a medium mixing bowl. Using a spatula (or your hands) gently mix dark chocolate chips and other optional ingredients into fruit and nut mixture, until evenly distributed. 1. Scoop out tablespoon-sized amounts of the mixture and form into small balls. Store in an airtight container in the refrigerator for up to a week. Other delicious mix-ins for these energy bites include dried cherries, walnut pieces, chopped dried banana pieces and shredded coconut. Calories 90, Total Fat 4.5g (Saturated 1g, Trans 0g), Cholesterol 0mg, Sodium 0mg, Total Carbohydrate 12g (Dietary Fiber 2g, Sugars 9g), Protein 1g, Vitamin A 0%, Vitamin C 0%, Calcium 2%, Iron 2% *Nutritional values are an approximation. Actual nutritional values may vary due to preparation techniques, variations related to suppliers, regional and seasonal differences, or rounding.